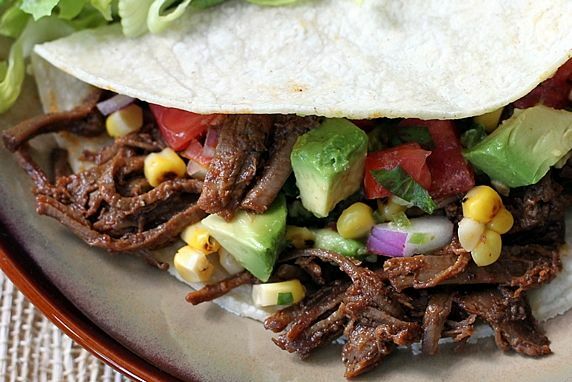 This flavorful meat makes a delicious filling for tacos, burritos, and enchiladas. Cut off as much fat as possible from surface of meat. 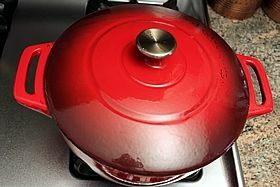 In 5-6 quart Dutch oven or pan, add water and meat, cover and cook over medium heat for 30 minutes. 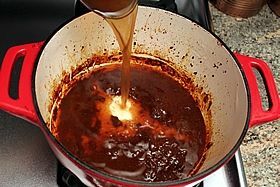 Uncover and cook until liquid boils away and meat is browned; turning it to brown on all sides. Lift out meat and set aside. 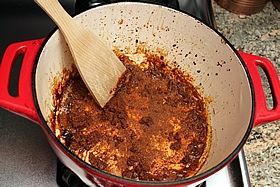 Sprinkle taco seasoning in pan and cook 1 minute. 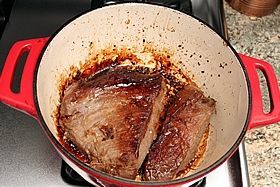 Add red wine vinegar and deglaze pan, scraping to loosen any browned bits. 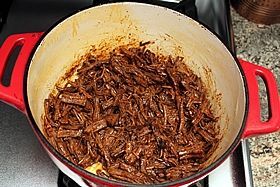 Stir in beef broth, whisk out the lumps. (It's okay if a few lumps remain--they will dissolve as the cooking continues. 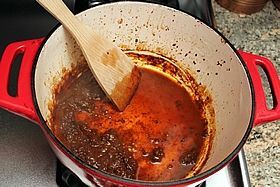 )*** Return meat to pan, bring to boil, cover and simmer over low heat until meat is very tender and easily pulled apart; approx. 2 to 3 hours. 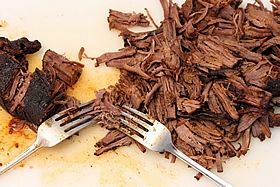 Let meat cool enough to tear into shreds using 2 forks. 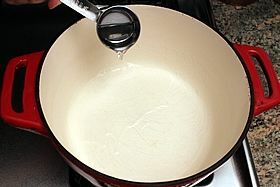 Remove fat from pan juices, if desired. 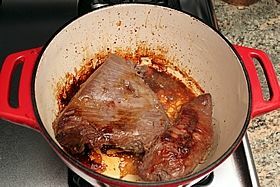 Return meat to pan with juices and cook uncovered until liquid is gone, but meat is still moist. 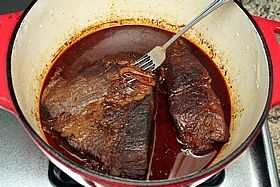 ***SLOW COOKER OPTION: At this point in recipe, you can move the meat and liquid to a slower cooker and finish cooking it on low for 6-8 hours. Use as filling for soft or crispy tacos, enchiladas, & burritos along with your favorite toppings. Also good on nachos and salads. Freezes and reheats well. This recipe falls into the category of comfort food for me. I'm originally a New Mexican girl, and I love anything I can put in a tortilla. 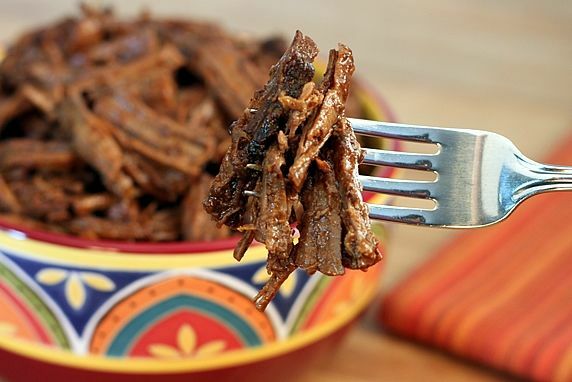 Although Ropa Vieja shredded beef was originally a Cuban dish, my family uses this flavorful beef in a variety of Mexican food dishes (tacos, enchiladas, burritos, nachos, salads). It tastes fantastic but isn't too spicy for those who can't handle a lot of heat. My mom (aka Grammy) passed this recipe on to me many years ago. She'd gotten it from my sister, Nelda, who'd gotten it from an old issue of Sunset magazine. 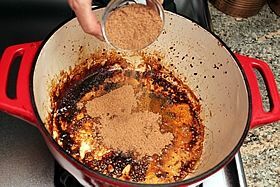 It's simple to make with just a few ingredients; and I've simplified it further by using my Fiesta Taco Seasoning Mix. 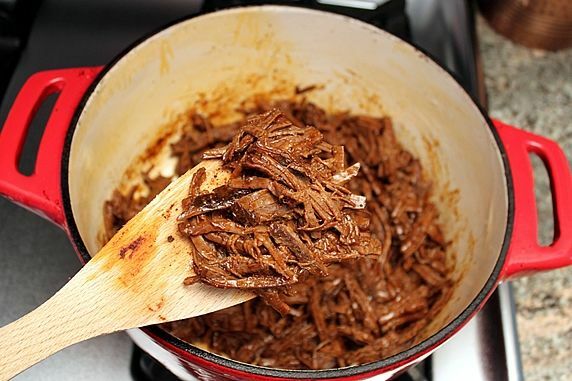 Ropa Vieja literally means "old clothes." Here's how Wikipedia explains the origins of it's name: There are many theories as to how the dish was named. One of the more popular ones is a story about a man whose family was coming to his home for dinner. Being very poor, the man could not buy them enough food when they came. To remedy his situation, he went to his closet, gathered some old clothes (ropa vieja) and imbued them with his love. When he cooked the clothes, his love for his family turned them into a wonderful beef stew. Step 1. 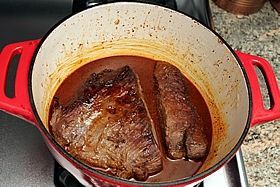 Assemble the ingredients: beef roast or steak (brisket, chuck roast, flank or skirt steak)--I used a 3 lb brisket, red wine vinegar, taco seasoning mix, low-sodium beef broth. If you prefer the convenience of a store-bought packet of taco mix, look for a low sodium variety. Most of the taco mixes exceed the USDA's recommendations for daily salt, and will make this recipe taste far too salty. Step 2. 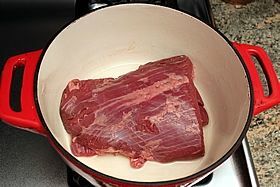 Add some water and the beef to a pan. Cover and cook over medium heat for 30 minutes. This sweats the meat so it releases it's juices and they start to brown. Step 3. 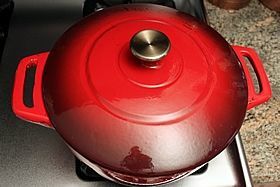 Remove the lid and cook until the liquid boils down and the meat is well browned. Turn the meat so it gets browned on both sides. Step 4. Remove the meat and set it aside. The browned bits left in the bottom of the pan provide yummy flavor. Step 5. Sprinkle the taco seasoning around the pan and let it cook for a minute to wake up the spices. Step 6. 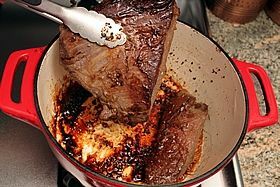 Add the vinegar and stir the pan to loosen all of those yummy browned bits. Step 7. Add the beef broth and whisk out the lumps in the liquid. It's okay if a few lumps remain--they will dissolve as the cooking continues. Step 9. 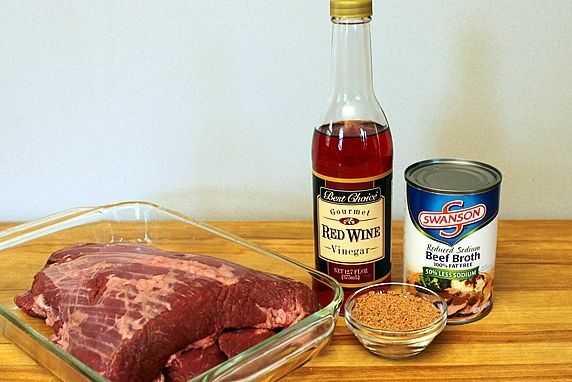 When meat can easily be pulled apart with a fork, remove it to a cutting board and shred it with two forks. Discard any fat. Step 8 (optional). 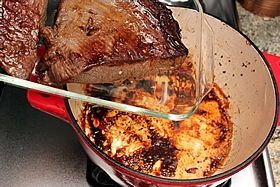 Depending on how fatty your meat is, you may want to degrease the liquid left in the pan. I always do this, because I like to make mine as low-fat as possible. But, this is optional. The easiest way I have found to degrease the liquid is to pour it into a grease separator. (You can spoon off the fat, but it's virtually impossible to get it all unless you refrigerate it first.) 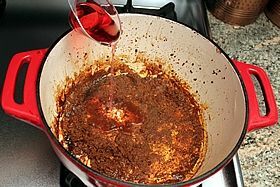 The technique for using a grease separator is illustrated in more detail in my posts on Make Ahead Fat-Free Turkey Gravy and Low Fat Pulled Pork. Step 9. 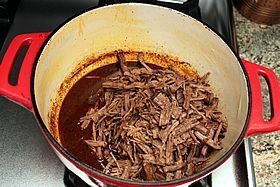 Return the shredded meat and liquid to the pot and cook uncovered until most of the liquid is cooked off. You want the meat to be moist but not runny. 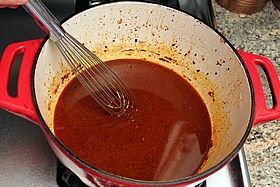 The taco seasoning mix has cornstarch in it, so it thickens the liquid to help it coat and cling to the meat. The Ropa Vieja beef is ready to serve! The browned meat combined with the savory sauce is melt-in-your-mouth delicous. 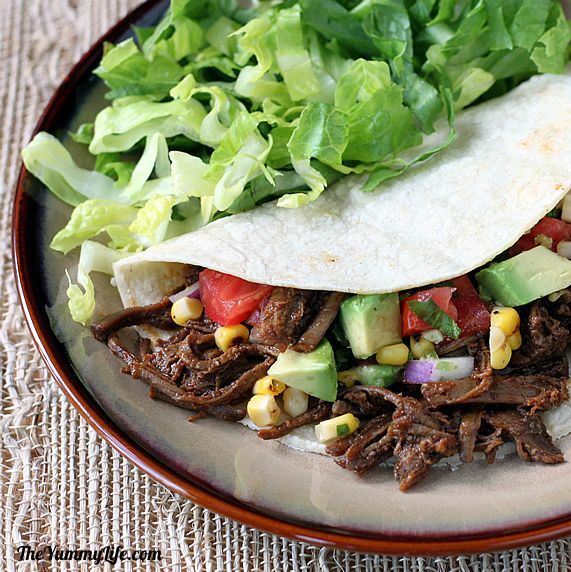 Use this meat as a filling for soft or hard shell tacos, using flour or corn tortillas. In the photo below, I've put the meat in a soft corn tortilla along with a fresh salsa. It's an easy, fresh, healthy dish. I could eat this every day. Yum. VERSATILE FOR MANY MEXICAN MEALS. 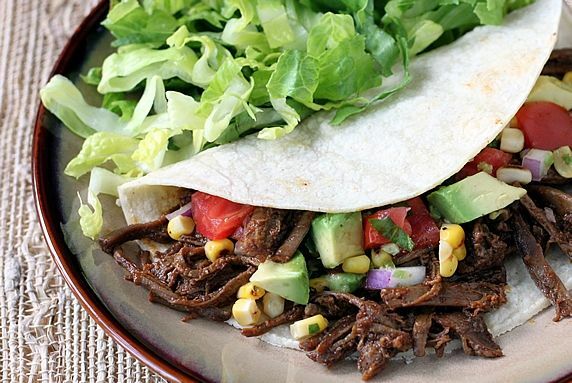 In addition to tacos Ropa Vieja beef makes a delicious filling in burritos and enchiladas. It's great on nachos and salads, too. FREEZE IT. This meat freezes and reheats well. It's a great thing to have on hand for a quick meal. GREAT COMPANY FOOD. I love to serve this when we entertain, because it can be made ahead and reheated at serving time. 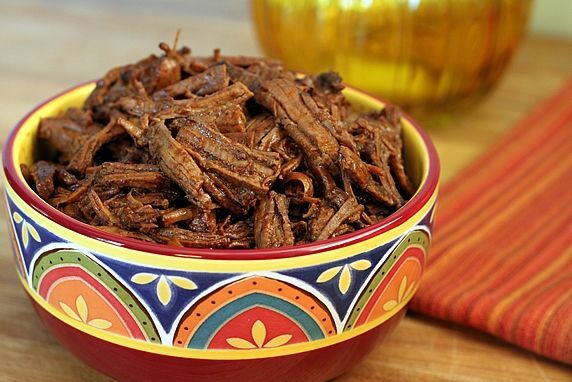 for serving Ropa Vieja in a make-your-own taco bar at a big dinner party. For a family dinner or a big party, this makes a delicious meal.